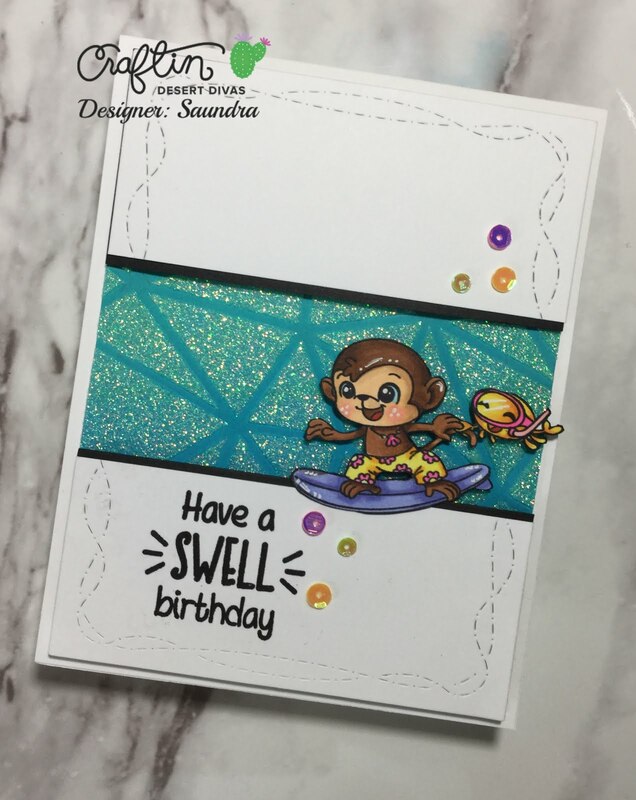 Today I am sharing a few cards featuring the new Craftin Desert Divas Waves Stamps and Polygon Stencil. If you love summer and surfing with cute critters the new Waves stamps set is perfect for you! 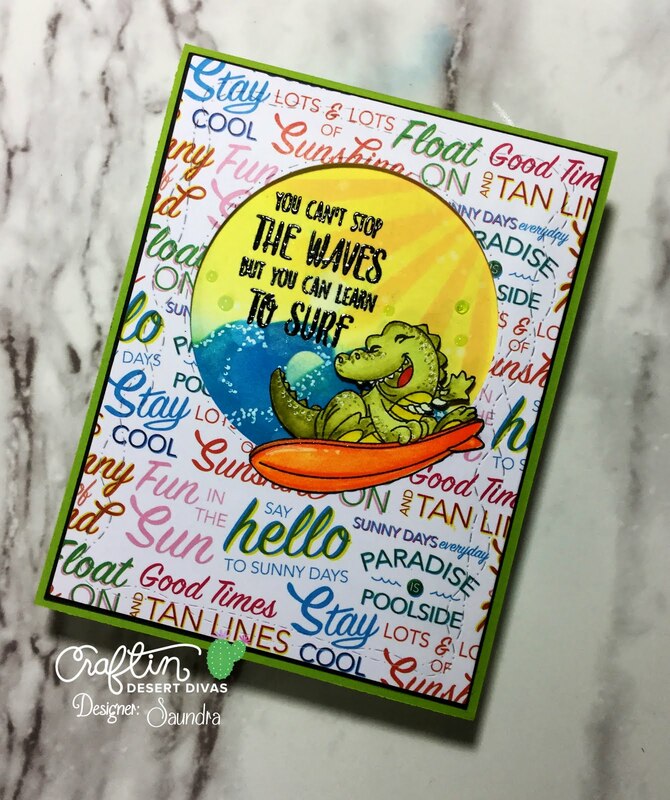 This first card was created with the fun alligator from the new Waves stamp set. I stamped and colored him with some Zig Clean Color Brush markers and added a few details with my white gel pen. I had this fun patterned paper that I wanted to used so I die cut it with the CDD Crazy Stitched Frames Dies and created a window with the Inside Scalloped Circle Dies. The background was created with Distress Oxide Inks. I sponged the sky with some Squeezed Lemonade and created the sun's rays with Fossilized Amber. For the waves I used CDD Outdoor Landscape Dies to create a stencil and used Distress Oxide Inks in Salty Ocean and Mermaid Lagoon. I added a few white gel pen accents and a few Nuvo Jewel Drops in Sea Breeze to finish off the scene. The sentiment comes with this set was stamped and heat embossed. For my second card I, again used the new Waves stamps but I paired it with then new Polygon Stencil. I started by inking a panel with Distress Oxide Inks in Peacock Feathers and Mermaid Lagoon. I added my stencil on top and used Nuvo Moonshine Glimmer Paste to give it this wonderful shine. I love the way it turned out! Once my panel was dry, I layered and popped up some white cardstock that I die cut with the CDD Crazy Stitched Frames. I cut the cardstock in half and trimmed off some from each side. I added a strip of black cardstock behind that piece and popped all of that up with some foam tape. I stamped my sentiment from CDD Waves stamps and added this little surfing monkey. He is just too cute! I colored him up with Copic Markers. I added a few sequins and my card was finished! Please check out all of the new release peeks on Facebook. You can visit the CDD Gallery or the Event page. All stamps, dies, and stencils will be available for purchase on Friday, June 15, in the CDD Shop.